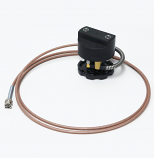 Works with all standard Soilmoisture Waveguides, Buriable, Slammer and Standard Connector types. Accuracy+/- 2% or less of Full Scale 0-100% volumetric water content. Product Brochures in French & German coming soon! 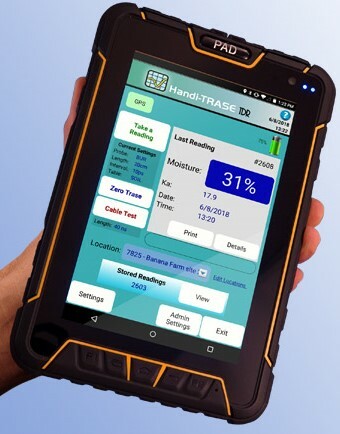 HandiTRASE handheld TDR unit & Software. 3 ft. micro USB to USB-A Cable. Instructional video and pdf's are loaded in the unit. 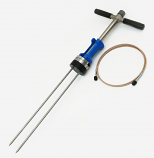 Please see our list of available probes! 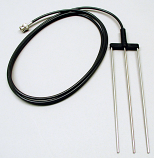 Works with all of our standard waveguides: Buriable, Slammer and Standard Connector types. 10 ps resolution minimum sampling rate. Measurement pulse: 1VPP, <130ps risetime (typical). Create Site Location Tags for any or all of your measurements. Editable journal entries can be added to your measurements, even days later. Export data to your desktop via Email, USB, USS-Ethernet, Bluetooth or WiFi. Built in camera to help document site conditions. User selectable English or Spanish languages. Android OS 5.1 running on A53 4-core CPU @ 1.2GHz. 16GB Flash memory, 2GB for OS. Display: 1280x800 full color IPS capacitive touch screen. Micro-SD memory expansion slot up to 32GB. Cameras: 8MP front & 2MP rear. Charge port, 3.5mm audio headphone/microphone jack & flashlight. Operating temperatures: -20 to +50C, storage temperatures: -40 to +60C. Humidity 5 to 95% non-condensation. Industrial Case: IP-67 & drop resistant from 1.2 meters.